A huge crowd packed Silverstone to see rookie hero Lewis Hamilton take pole at the British Grand Prix, but he was helpless to stem the challenge of Kimi Raikkonen's Ferrari. Hamilton led early on but was struggling for balance and after six laps was attacked by Fernando Alonso (McLaren) and Raikkonen, with Raikkonen pushing ahead on lap 16 as Hamilton was delayed leaving his first pit stop. Alonso moved ahead of Hamilton on his pit stop and it was then a head-to-head fight between the Finn and the Spaniard. 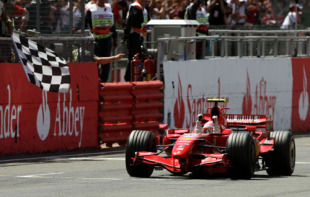 Raikkonen was the faster of the two and his pace, coupled with fractionally better pit work by the Ferrari team, secured Raikkonen's second win in as many weeks. Alonso ran second ahead of Hamilton - again on the podium - in third. Robert Kubica was fourth in his BMW Sauber while Felipe Massa took a fine fifth from the pit lane after his Ferrari stalled on the grid and caused a delayed start. Nick Heidfeld, Heikki Kovalainen and Giancarlo Fisichella rounded out the points scorers for BMW Sauber and Renault.